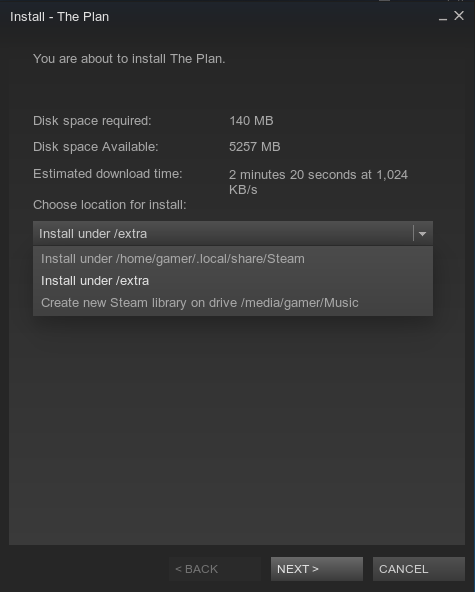 As far as I know, Steam (and pretty much every other application) is installed to the "/" partition. If that's the case, why is such a small "/" partition recommended? Couldn't one or two Steam games wipe out your "/" fairly easily? It seems like a "/" partition of 20GB max is usually recommended. Am I missing something, or if I plan on installing games and applications should I make a larger "/" partition? Maybe I'm weird, but looking at my Windows 7 install "Program Files accounts for nearly 700GB of disk usage, and everything else (including Windows 7) is barely 100GB. Is that not normal? It just seems more normal in my mind to have "/" and /home switched. The first step creates the directory, the seconds makes sure you can access it as a normal user. U don't need to create /boot. If u want have 2 systems, u can install grub on /. (/ would have 10/20 GB) So 2 partition(/,/home) will be good and u can choose where install game on steam. If u have more than 4/8 GB don't create swap cause it ll be not used. Not the answer you're looking for? Browse other questions tagged partitioning games steam or ask your own question. Where is the steam directory folder in 12.04? How to increase swap space? Is there any possible (and simple) way to delete my Windows partitions and extend my Ubuntu partitions?